Description: This is a large shrub or small tree that is 8-30' tall at maturity, forming a long narrow trunk and either a sparsely branched or unbranched crown. The trunk is up to 6" across (rarely up to 1' across), terete (circular in circumference), and more or less spiny. Trunk bark is light gray or light brown and relatively smooth, but becoming increasingly rough with age. The spines are relatively stout, but sharp, and they are often arranged in curvilinear patterns around the surface of the trunk. In addition, large petiole-scars persist on the trunk (sometimes almost surrounding it) that have a flattened U-shape. Ascending lateral branches are sparingly produced (if at all) during later stages of development. These branches are rather stout, terete, spiny, and either light gray or light brown. Like the trunk, they also have persistent leaf-scars. Alternate compound leaves occur toward the apex of the trunk and the apices of any lateral branches; they are widely spreading. These compound leaves are 2-4' long and 1¾-3½' across; they are mostly bipinnate, although some leaves are partially tripinnate. 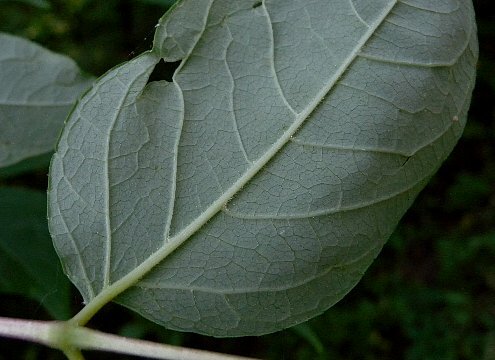 Along the primary rachis of each compound leaf, there are several pairs of simple-pinnate leaves. Along the secondary rachises of these simple-pinnate leaves, there are 5-13 leaflets, although some of these leaflets are replaced by a trifoliate arrangement of 3 leaflets when the compound leaves are tripinnate. Individual leaflets are 2-3½" long and 1½-3" across; they are narrowly ovate to broadly ovate in shape, while their margins are serrated. The leaflet bases are narrowly rounded to rounded and often asymmetric, while their tips are somewhat elongated and narrow. The upper surface of leaflets is medium to dark green and glabrous, while their lower surface is pale green to nearly white and either glabrous or slightly pubescent. When leaflet pubescence occurs, it is typically restricted to the lower side of the central veins. The leaflets have short petiolules (basal stalklets) about ¼" long. The petioles of the compound leaves are up to 1½' long and their bases are stout. The petioles and rachises of the compound leaves are light green, brownish green, or light red; they are glabrous and sometimes spiny on their undersides. The apex of the trunk and apices of any lateral branches can produce 1-3 inflorescences that are individually 1½-4' long and 1-3' across. These inflorescences are compound panicles of floral umbellets. During the blooming period, the branches (peduncles, pedicels, etc.) of each inflorescence are light green to reddish green and pubescent. Each umbellet is about ¾-1" across and globoid in shape, consisting of 12-20 flowers and their pedicels. In each inflorescence, the flowers are either all perfect or there is a mixture of perfect and unisexual flowers. Each flower is up to ¼" long, consisting of 5 triangular petals that are white, a short-tubular calyx that is light green, 5 exerted stamens (for perfect or male flowers), and a 5-celled ovary with 5 styles (for perfect or female flowers). The blooming period occurs from mid- to late summer. The flowers are fragrant (reported to be lemony). Afterwards, the flowers are replaced by small berries. At maturity during the autumn, these berries are about ¼" long, ovoid-globoid in shape, finely ribbed, and either dark blue or black. These berries have thin fleshy interiors and they contain 2-5 flattened seeds. At this time, the branches of the fruiting inflorescence become red. The root system has long fleshy rhizomes, from which clonal offsets can develop. The deciduous leaves turn yellow (less often, bronze red) during the autumn. Cultivation: The preference is partial sun, moist to mesic conditions that are well-drained, and fertile loamy soil. However, this tree (or shrub) also adapts to soil that contains rocky material, clay, or sand, and it has a wide pH tolerance. The flowers and berries are not produced until the third or fourth year of development, if not later. While this tree (or shrub) can be planted north of its range (to about Zone 5), it may die back to the ground if there is exposure to severe winter cold. 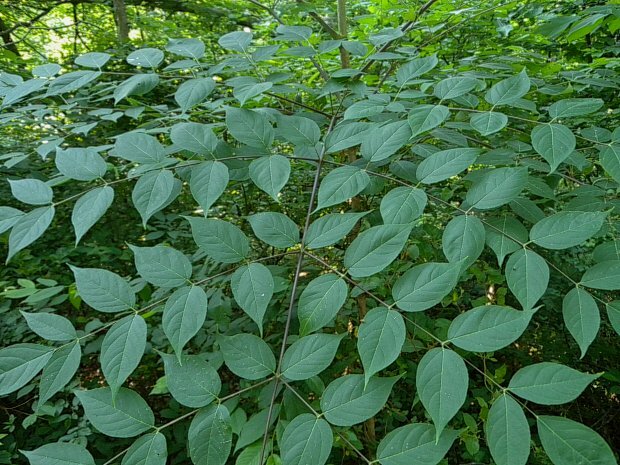 Range & Habitat: The native Devil's Walkingstick (Aralia spinosa) is occasional in southern Illinois, while in the rest of the state it is absent (see Distribution Map). Illinois lies along the northwest range limit of this species. However, sometimes it is cultivated as a landscape plant in areas that are north of its natural range. Habitats include upland woodlands, lowland woodlands, wooded slopes, wooded ravines, bluffs, woodland borders, wooded areas along streams, savannas, and thickets. Devil's Walkingstick prefers areas with a history of disturbance from occasional wildfires, logging, etc., as this reduces excessive shade from overhead canopy trees. Faunal Associations: The flowers are cross-pollinated primarily by bees. Both nectar and pollen are available as rewards to such floral visitors. Very few insects are known to feed destructively on Devil's Walkingstick (Aralia spinosa). Sometimes this tree (or shrub) becomes defoliated during early autumn by the polyphagous Epicauta funebris (Margined Blister Beetle). The abundant berries are eaten by such birds as the Cedar Waxwing, White-Throated Sparrow, Swainson's Thrush, and Wood Thrush. Until it became extinct, the Passenger Pigeon also fed on the berries. Mammals that have been observed to feed on the berries include the Black Bear, Red Fox, Striped Skunk, and Eastern Chipmunk. These fruit-eating animals spread the seeds of this tree (or shrub) to new locations. White-Tailed Deer reportedly browse on the foliage upon occasion. Photographic Location: A moist wooded slope in Pope County of southern Illinois. 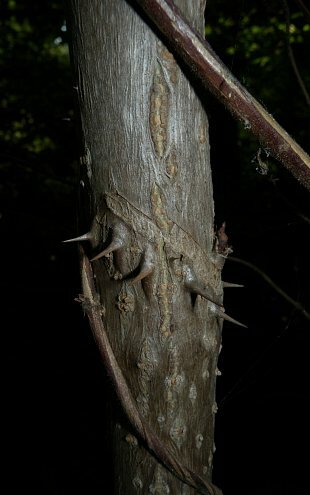 Comments: Because of its exposed spiny trunk and exceptionally large compound leaves, the Devil's Walkingstick (Aralia spinosa) is sometimes grown as a curiosity in landscaped areas. It produces large panicles of fragrant flowers during the summer and dark berries during the autumn. This woody species, which is native to southern Illinois, is often confused with a similar species, Aralia elata (Japanese Angelica Tree). The latter has been introduced into North America as an ornamental landscape plant, where it is often cultivated. Devil's Walkingstick can be identified by its larger compound leaves (up to 4' long) and larger panicles of flowers or fruit (up to 4' long). In addition, this native shrub has leaflets with conspicuous petiolules (about ¼" long), while the leaflets of Japanese Angelica Tree are sessile (or nearly so). On the leaflet undersides of Devil's Walkingstick, the lateral veins don't extend all the way to the leaflet margins (by curving parallel to them), whereas these veins do extend to the leaflet margins on Japanese Angelica Tree. Sometimes Aralia spinosa is referred to as Hercule's Club, but this common name more properly applies to another woody species, Zanthoxylum clava-herculis. While this latter species has a superficially similar appearance to the Devil's Walkingstick, it is a member of the Citrus family (Rutaceae). This latter tree (or shrub) has a more southern range and it is not found in Illinois. Unlike Devil's Walkingstick, its compound leaves are simple-pinnate and smaller in size.